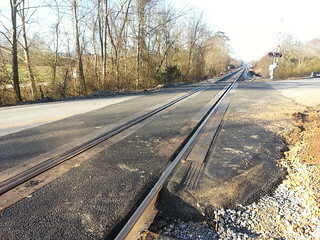 Background: After posting the previous story about the hazardous condition of the RxR crossings on the Silver Comet Trail, I had several responses from Facebook readers that had crashed, or been involved with bicycle crashes on the RxR tracks on Old Cedartown Rd. I thought this warranted additional investigation. Summary: Based on analysis of track angle from Google Maps photos I found that the CSX track crossed Old Cedartown Rd at an approximate 25° skew angle. The American Association of State Highway and Transportation Officials (AASHTO) 2010 Guide for the Planning, Design and Operation of Bicycle Facilities, states the “If the skew angle is less than 45°, special attention should be given to the bikeway alignment to improve the angle of approach, preferably to 60° or greater, so bicyclists can avoid catching their wheels in the flange and losing their balance.” The skew angle of the CSX RxR tracks on Old Cedartown Rd exceed the minimum suggested skew angle for un-improved rail flanges by 40°. As part of this report I have a prepared a suggested approach to correct this problem, which will have a minimal impact on local vehicular traffic and marginal cost to implement. 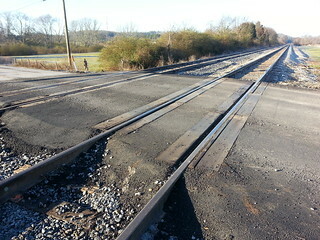 The CSX RxR crossing on Old Cedartown Rd tracks are oriented at an excessive skew angle and pavement is in poor condition. Very hazardous to bicycle traffic, especially considering that this crossing is part of a recreational trail which would be used by children or seniors that would not be reasonably expected to have special training to cross such hazards safely. To determine the skew angle of the railroad tacks I used a computer to analyze the relative angles from a Google Maps image. The image from Google Maps is shown below. I color annotated the map image: blue is the Silver Comet Trail, green is Old Cedartown Rd, dashed-red is the railroad. To determine the skew angle of the railroad tacks I used a computer to analyze the relative angles from a Google Maps image. I rotated an orange line segment that was coincident with the road, to align with the tracks. The rotation was 25°. RxR, Old Cedartown Rd skew angle. Clearly, the current design needs to be fixed. An ideal crossing angle would be 90°. I rotated the orange line perpendicular to the tracks and aligned it with the north entrance to the Silver Comet Trail. This approximates an ideal crossing situation; shortest distance and perpendicular to the tracks. If a concrete ramp and pad were added to the south entrance to the Silver Comet Trail (yellow line), it would significantly shorten the distance traveled on public roads and provide an improved crossing situation for the railroad tracks. Also the addition of a HiRail pad for the pedestrian and bicycle traffic would create an ideal and safe crossing. Good news. Spoke with Ken Apperson at Ohio Gratings today, and he is still very enthusiastic about helping us replace the grates at the Brushy Mtn tunnel. In fact, he admitted he spent more time thinking about this than he should have. We are now looking at cutting the concrete for a new custom design grate built specifically to fit our requirement. I have an appointment Saturday afternoon with a contractor that specializes in concrete drilling and sawing. I’m taking him up to the tunnel to see the current grates and determine if he can make the required cuts. If we can get the grates replaced with cutting the concrete versus re-pouring the concrete and installing an embed-frame, it will save many thousands of dollars and many weeks of planning, design and fabrication work. A BIG thank you to Ken for proposing and designing this approach. Welcome to the Atlbike Trail Foundation web site. We are using http://atlbike.org as our home site. Of course, the main goal of the site is to encourage and promote local cycling. The foundation is just an extension of this goal and a way to manage the cost of the ambitious goals that started in 2010.